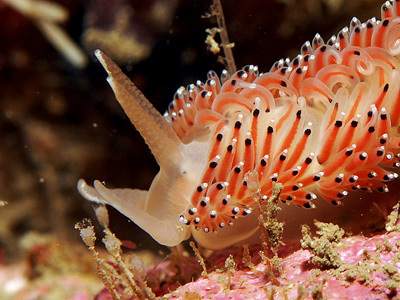 Description: This rare nudibranch has a translucent white body with thin lines of superficial white pigment on the frontal surfaces of the rhinophores and the oral tentacles. The line on the oral tentacles continues across the front of the head, and there is a line along the middle of the tail. The digestive gland is orange or pink in colour with a black area at the base of each ceras and a black glandular area just below the cnidosac. The cerata have white terminal rings and the largest ones have long curled tips. 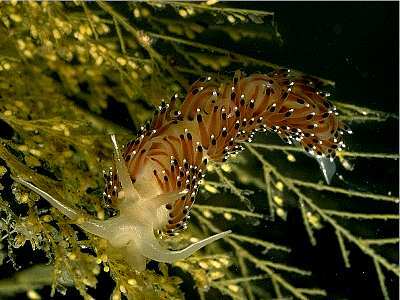 Habitat: The diet of this species is unknown, but it has been taken amongst the hydroids Nemertesia ramosa, Plumularia setacea and Halecium halecinum. The spawn is a thin thread deposited in a spiral. Distribution: Originally described from Torbay, this species has been found at Lundy, off the Lleyn peninsula and in Lough Swilly, North Donegal. Recently it has been found at the Maidens, near Larne, Northern Ireland, on several occasions. 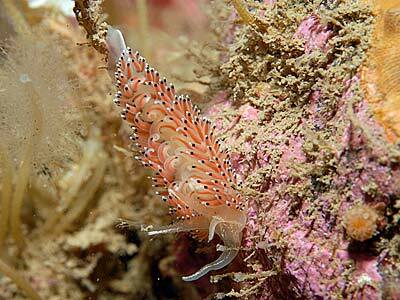 It is a frequent animal in the Mediterranean, where it was known as Caloria maculata. Cerata with subterminal black glands. White line on oral tentacles continuous across front of head. Picton, B.E. & Morrow, C.C. (2016). Caloria elegans (Alder & Hancock, 1845). [In] Encyclopedia of Marine Life of Britain and Ireland.